Clickbank is the largest affiliate network of digital products in the world. With over 10,000 digital products including anything from e-books on dog-training, to training manuals on how to make money online, this network will allow you to find just about any informational product to sell online in just about any industry. There are several different components of Clickbank that you need to understand in order to be able to find your way around efficiently and to choose products based on the correct criteria. In this tutorial we are going to walk you through everything from setting-up a Clickbank account to grabbing your linking codes. We’ll also outline how to take advantage of a great Clickbank tool offered here at Wealthy Affiliate and show you how to choose “quality” products to promote. Once you have signed-up for your account, you will be able to grab your own unique linking codes. These codes will tell the Clickbank network when someone has clicked on your link and purchased a product. The unique linking codes will tally a sale in your Clickbank account, which will show you exactly what product you sold, who the buyer was & their email, when it was sold, and how much you earned from the sale. To get access to the linking codes for all the products on Clickbank, you will need to go to the Marketplace. This is the database of all the products that are on Clickbank and you can search for products according to the criteria that you specify (we will get into “which” products to promote in the next section). 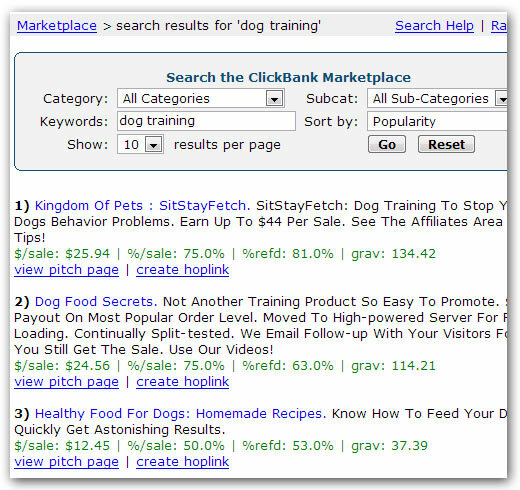 In this example, we typed “dog training” into the search. Here are the results that we received. The next thing you are going to need to do is click the “create hoplink” button. A window will pop up asking you to input your Clickbank nickname and tracking ID (optional). 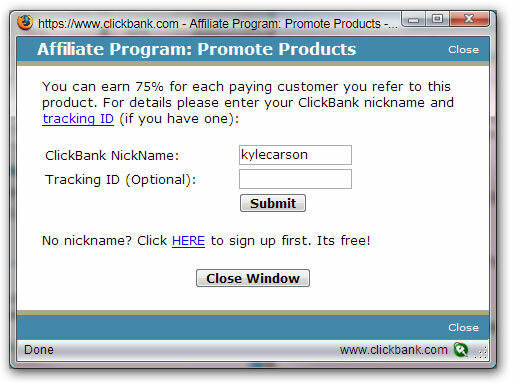 To create your link you will want to input the Clickbank nickname that you chose upon signing-up. To demonstrate this, we are going to create a link under the first "dog training" product using the nickname “kylecarson”. Clickbank includes link tracking capabilities within their system, and it is now easier than ever to track your campaign performance and determine which ad groups, and even keywords, are your top performers. 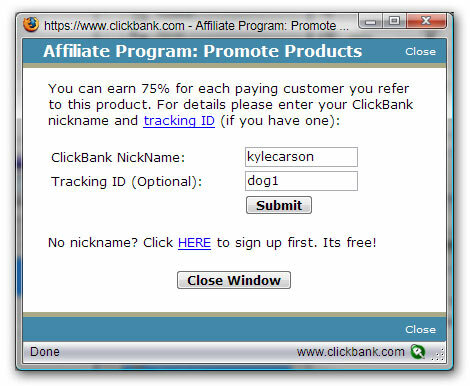 When you create your links within the Clickbank marketplace, you will be given a form where you enter your Clickbank "nickname" and also an optional tracking ID. This tracking ID will allow you to create multiple links for the same product with different tracking URLs, allowing you to track the performance of different links. Now, if you make a conversion with this link, it will show up within your Clickbank account Reporting -> Analytics section with the DOG1 id attached, thus allowing you to determine where your sales are coming from. In the screen shot above you will see there is a "code" column. This will indicate which code (if any) produced the sale, and you can also see all the details associated with that particular transaction. Knowing which links generated the sale can be highly beneficial because you can attach a unique tracking code to campaigns, ad groups, or even keywords to determine the effectiveness of your promotions and where you are making sales. There are certain criteria that you need to consider before promoting a product on Clickbank. Since anyone can add a product to the Clickbank marketplace, there are many lower quality products and these typically have very high refund rates. A refund means a lost commission on your end, so you definitely do not want this! In addition, there are products that look good from the outside (their sales page), but in reality they will just end up costing you money if you try to promote them. In this section we will outline the main criteria that you should follow when deciding whether or not you should promote a product on Clickbank. Gravity is an internal calculation done by Clickbank based on an algorithm that takes the number of affiliates making sales and the actual volume of sales over the past 8 week period. A high gravity either indicates that there are many affiliates making money promoting the product, or that the product is brand new and received a lot of hype. Do not base your decision on whether or not to promote a product solely on its gravity ranking…there are a lot of poor quality products with a high gravity! Conversely, there are also a lot of high quality products with low gravity. This is the amount after refunds and Clickbank fees that you can expect per sale. This will not be the actual figure that shows up in your Clickbank account, but overall this is what you can expect to receive at the end of the day. This is the most accurate indicator of how much you will earn per sale with any given product. The fees are split between the Affiliate and the Merchant based on the commission structure. This is the % of affiliates making sales to overall sales. The higher the referral % is, the higher the percentage of affiliates making sales. If this number is over 65%, then it is a safe product to promote. Anything less than this, you are going to be competing head-on against the product owner. This is not given to you within Clickbank, but it is important to check out refund rates before you promote a product on Clickbank. Some products have as high as 35% refund rates and this wreaks havoc on your overall ROI. We suggest choosing a product that has a lower than 15% refund rate. Let's take a product that costs $49 and has an $earned/sale of $18.50 with a 50% commission. This means that affiliates earn an average of $18.50 after all refunds. Each sale amounts to 22.16 for the merchant and affiliate since they split the commissions at 50% each. We have a refund calculator built into the Clickbank Research tool here at Wealthy Affiliate. Please refer to this for refund rates on products within Clickbank. Direct linking is a very popular way to promote a product online because it is the easiest way to send traffic to a site without having to build your own landing page / website. Line 2: Show You How to Make Money.. Note that your display URL and your destination URL are not exactly the same. The destination URL will always be the affiliate link or the page that you want to send your traffic to. The display URL should be the root domain name of the page that your visitors end up on. It is important that your display URL is the same as the page that the person is sent to, and in this case it is WhoLovesMoney.com. You do not want to have your hoplink as your display URL as this will have no appeal to anyone looking at your ad (we see this mistake all the time!). 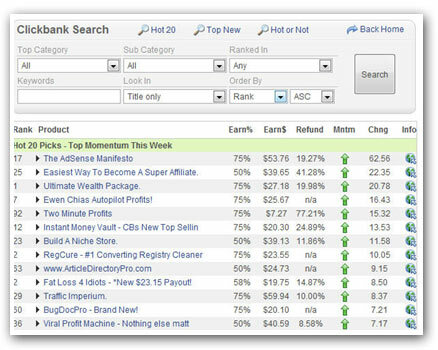 There is a great Clickbank Research Tool available to you to use within Wealthy Affiliate. This tool will help you determine which products on Clickbank are worth promoting, and which ones are not. It will also allow you to sort Clickbank products based on a number of attributes, including: price, earned-per-sale, gravity, refund rate, and momentum. "Momentum" is a way of determining which products are gaining momentum, and which ones are losing momentum. It is based on an algorithm that takes all of the product's attributes into consideration. If the momentum of a product is high, chances are it is gaining exposure and people are having success promoting it. Losing momentum will indicate that a product has either lost a lot of its affiliates, or hype around the product is dying down (neither of which is necessarily a bad thing for you as an affiliate). Clickbank is usually the first affiliate network that marketers choose because it is very easy to use. The info products within the marketplace allow you to promote items in just about any niche you could imagine. You need to remember that this is not the only place that you can gain access to affiliate products and you should definitely not limit yourself to just Clickbank. There are many other very profitable and high quality affiliate networks as well as independent affiliate programs outside of Clickbank. There are $100,000s each day being made on Clickbank and you can definitely leverage the techniques and tools here at WA to increase your Clickbank earnings. Replace "wacase" with your Clickbank nickname to get credit for the sale. We are here to support any Clickbank questions that you may have. Please let us know if you have any questions about Clickbank in the forum.